On the afternoon of May 1st, 2012, Choi Woo Shik who plays the role of Do Chi San in SBS drama series “Rooftop Prince” tweeted on his Twitter account, “We appear on the test paper,” and uploaded a photo. 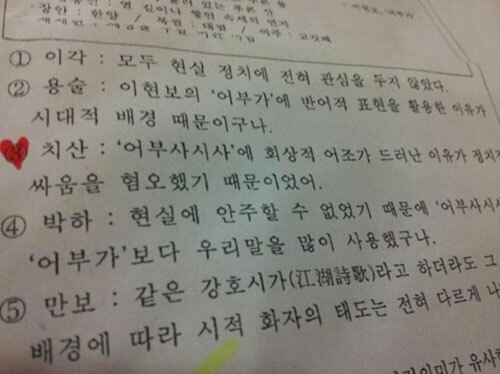 The photo shows that the dialogs between characters in “Rooftop Prince” appeared on the examination papers. Netizens commented on the photos, “Very popular, examination authority also uses it,” “Really is the trend of Crown Prince” and so on. 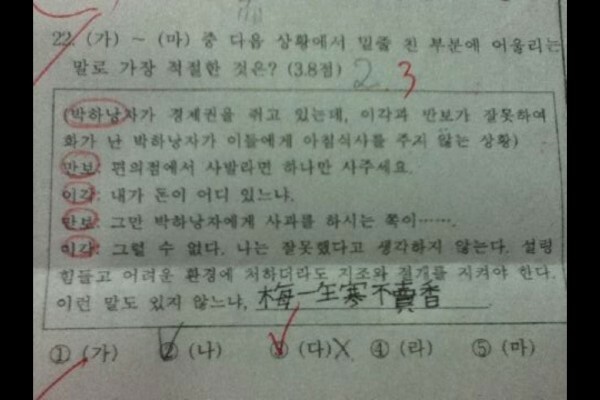 Subsequently, some other photos which show the questions based on “Rooftop Prince” on exam papers also been tweeted to Twitter. Currently, it’s the season of midterm examination in South Korea. The translation of the questions appear on the test paper listed below the photos. Compare the work between “A Song of a Fisherman” by Yi Hyeon Bo, the scholar during the Jungjong reign, and “The Fisherman’s Calendar” by Yun Seondo, the scholar during the Hyojong reign in Joseon Dynasty. Lee Gak: The two persons are not concerned about politics in reality. Yong Sul: Yi Hyeon Bo’s “A Song of a Fisherman” uses litotes because of background of the era. Chi San: The nostalgia mood in “The Fisherman’s Calendar” is due to his aversion to the political struggle. Park Ha: Because of doesn’t content with reality, the “The Fisherman’s Calendar” uses more Hangul than “A Song of a Fisherman”. Man Bo: Even if they’re similar folk songs, but because of different eras, the attitude of poets is also different. A question to select the appropriate auxiliary word for the underlined sectio. Lady Park Ha controls the economic power. Because of Lee Gak and Man Bo did something wrong, Park gets angry and do not make breakfast for them. Man Bo: Buy cup noodles for us from convenience store. Lee Gak: I where got money. Man Bo: Might as well apologize to Lady Park Ha. Lee Gak: Absolutely not. I do not think I’ve done anything wrong. Even in a difficult environment, also have to maintain integrity and dignity. The hanja 梅一生寒不卖香 means “plum blossom has fine quality, not fearing the cold, standing proudly in the snow, and does not fight for favor with fragrance”.